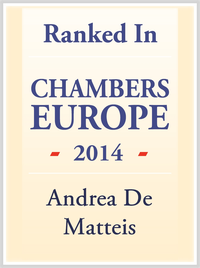 Andrea De Matteis, the Founding Partner of the DE MATTEIS law firm, has been recognised for his work in the field of Italian Competition Law by Chambers Europe 2014 - one of the most important legal guides in the world. In their words: Andrea De Matteis of DE MATTEIS Studio Legale is widely recognised for his work with leading international clients and is described by commentators as "entrepreneurial" and "very good at co-ordinating a deal." The Chambers Guides have been ranking the best law firms and lawyers since 1990, and now covers 185 jurisdictions throughout the world. Chambers ranks both lawyers and law firms based on research made by 150 full-time editors and researchers who are based in London. By talking with lawyers and clients, conducting in-depth telephone interviews their team of multi-lingual researchers identify the best of the best in each jurisdiction.